This post is another "little bit about everything over the past few weeks" kind of post. 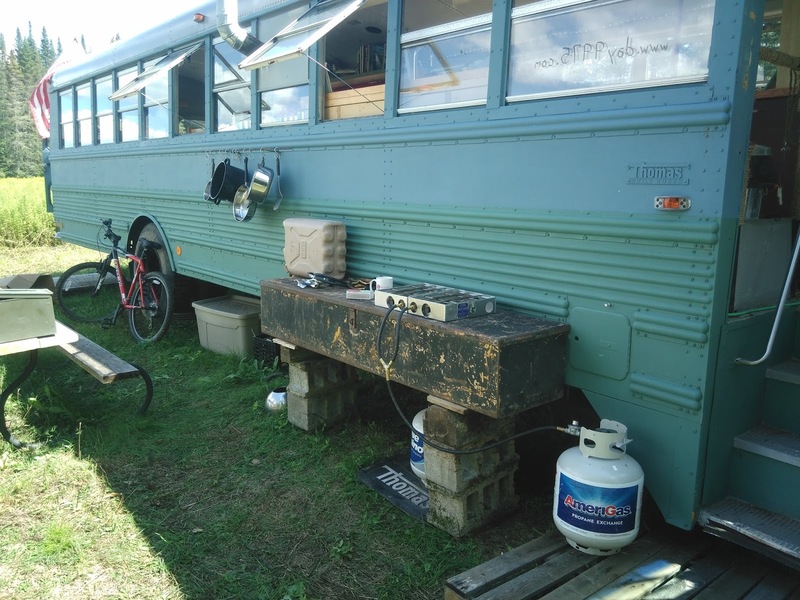 Up at the bus back on Day 10431, Nakahla and I continued improving the outdoor field kitchen. Using some steel shelf wall hangers, a rebar rod, safety wire and some bungee S-hooks I made a pot and pan holder. The truck box counter was raised up on cinder blocks to a better working height. I'd still like a decent canvas over the top for protection from rain and sun. Here's the picnic table I rebuilt a few weeks ago. 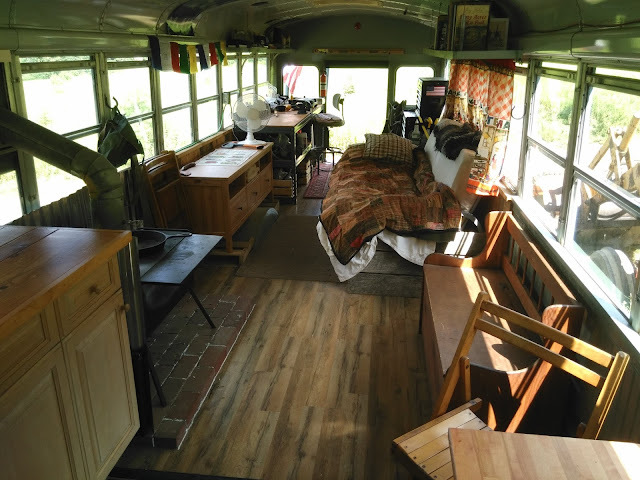 A lived-in housebus. With the sun shining I can keep it cool by running electric fans for "free." I also had the largest gathering at the bus in a while when two carloads of family showed up, minutes after a curious neighbor pulled in to check out what they thought was a logging operation. 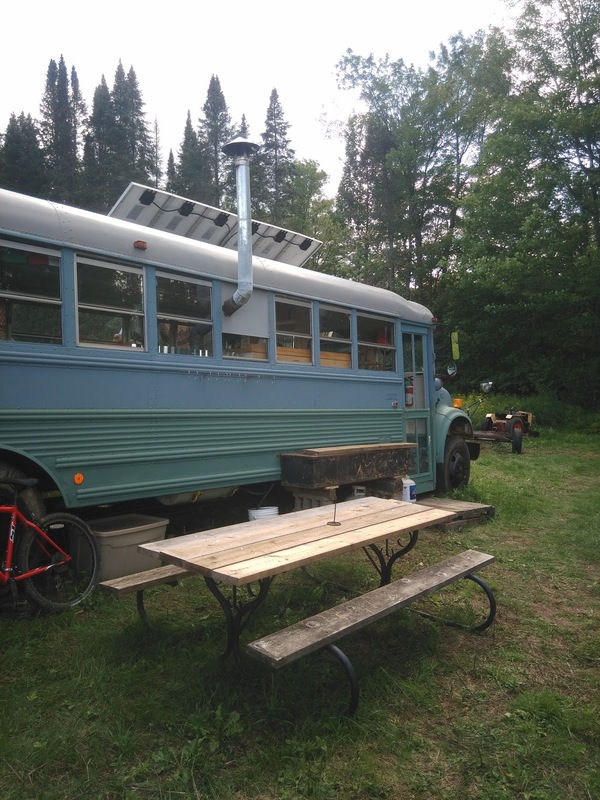 No logging operation, neighbor; just a crazy veteran in a bus that has a chimney who wants to make his own food and built a house. 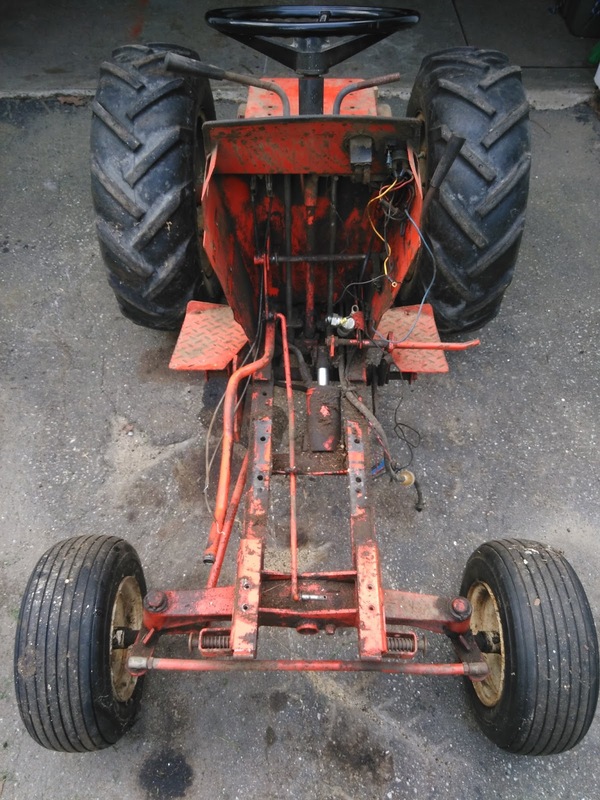 The little Case tractor has a Gremlin. I know I have mentioned them before, but I have to bring them up again. These mythical creatures were discovered by Royal Air Force personnel around the Battle of Britain. 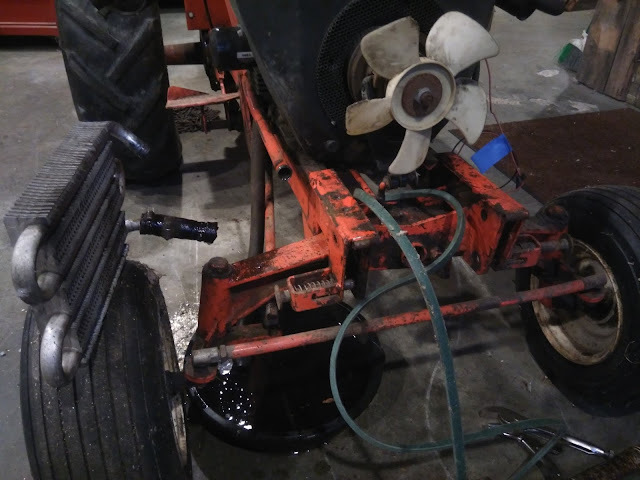 Gremlins were known to chew electrical wires, freeze up instruments, introduce air into hydraulic systems, deflate tires, etc. The RAF, in the midst of fending off the Nazis, struggled with them for some time before they realized how they operated. So the little tractor is effectively out of commission, right when I needed it to mow down some grass, and move that old trailer around with it's new drawbar. I'll need to get some stamps. 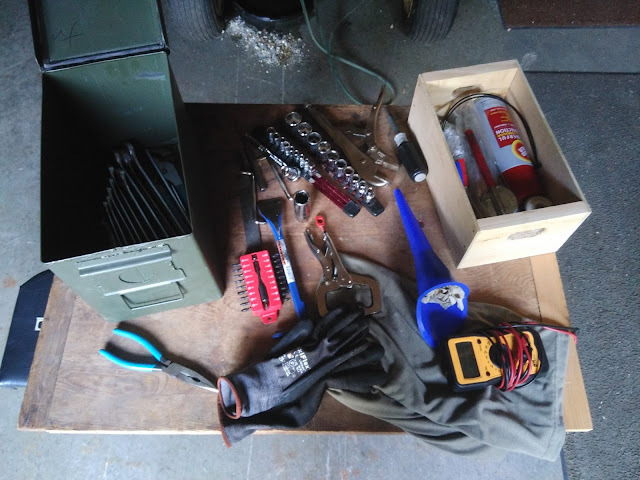 In order to keep more tools with me between the property up north, and working on projects down south during the week, I put common tools into a fat .50 cal ammo can. 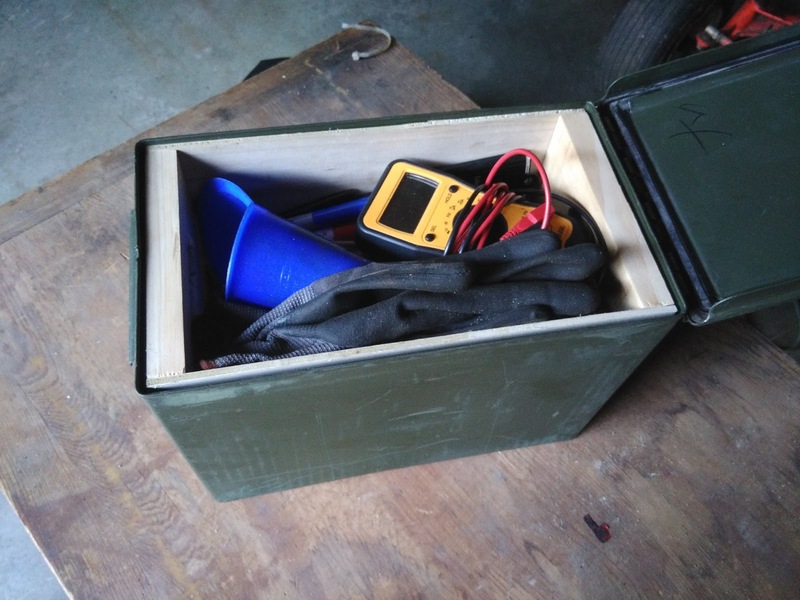 This took forever to pack and unpack, though, so I made a little box out of scraps for loose items. I was surprised with how much more I could fit in the can this way. On Day 10439 we returned to observe the solar eclipse. We weren't up long enough to do too much else... I did get some wood split, though. 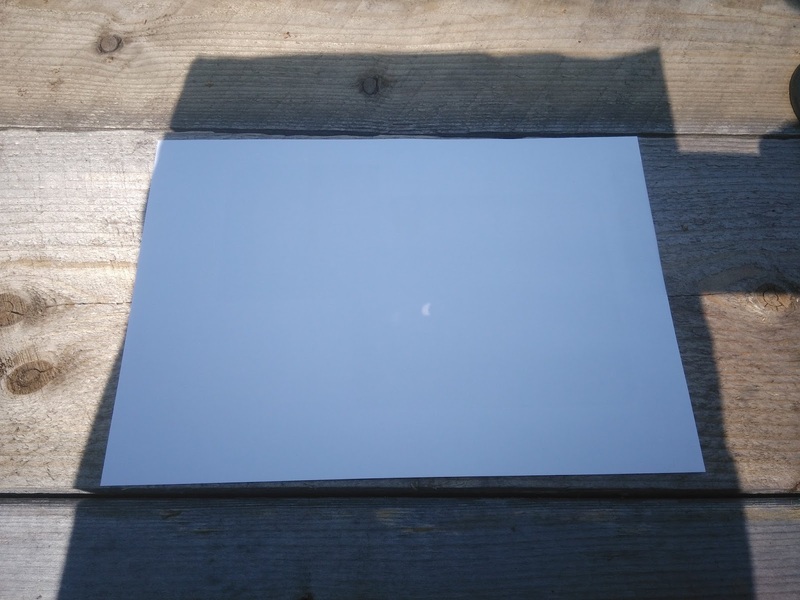 We observed the eclipse with a pinhole, which was pretty fascinating. My first instinct was that the shape of the hole in the tin foil made the crescent shape on the paper, but whichever way it was rotated the sunlight kept the same orientation. Cool. Next I fashioned eclipse goggles. Knowing the sun is bright, and so is a welding arc, I figured my Shade 10 welding helmet would be dark enough to view the partial eclipse. Not so! After some Googling, I found that a Shade 14 is needed to observe the sun. 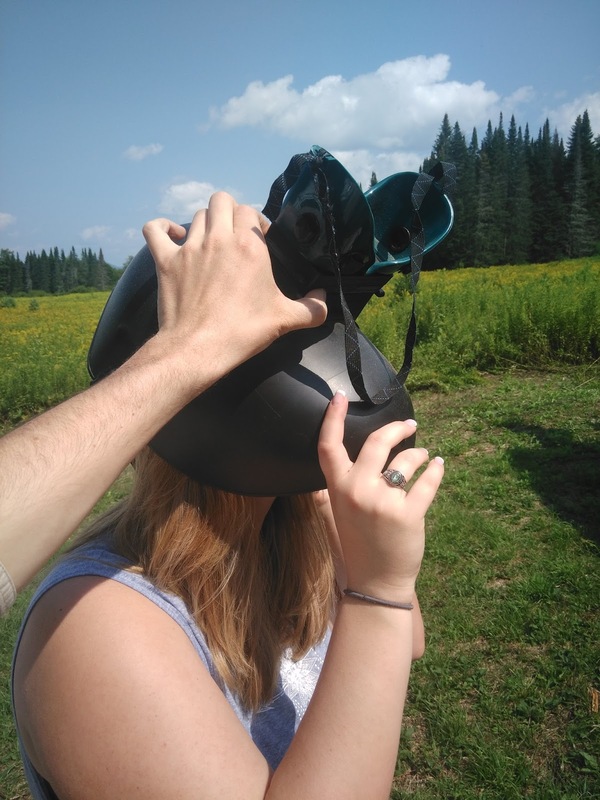 Holding the cutting goggles in front of the viewplate of the welding helmet created a Shade 15 eclipse watching helmet! 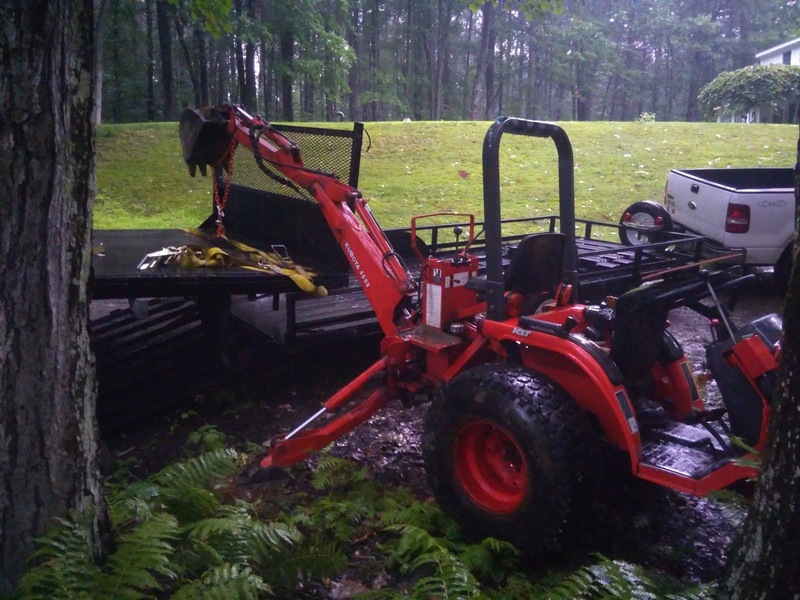 Even with only half the sun blocked, it was noticeably dimmer up at the property. Like the sky looks when there is smoky haze in the air. Looking forward to April of 2024 for next great American eclipse! Removing and draining the hydraulic system's radiator. I used my dad's tractor to lift the blown Kawasaki motor out. Ready for the pressure washer. For a quick morning project I Frankenstein'd my old laptop, with a dead battery, to run off a 12vdc to 19 vdc converter, and added an extra cooling fan. Why? 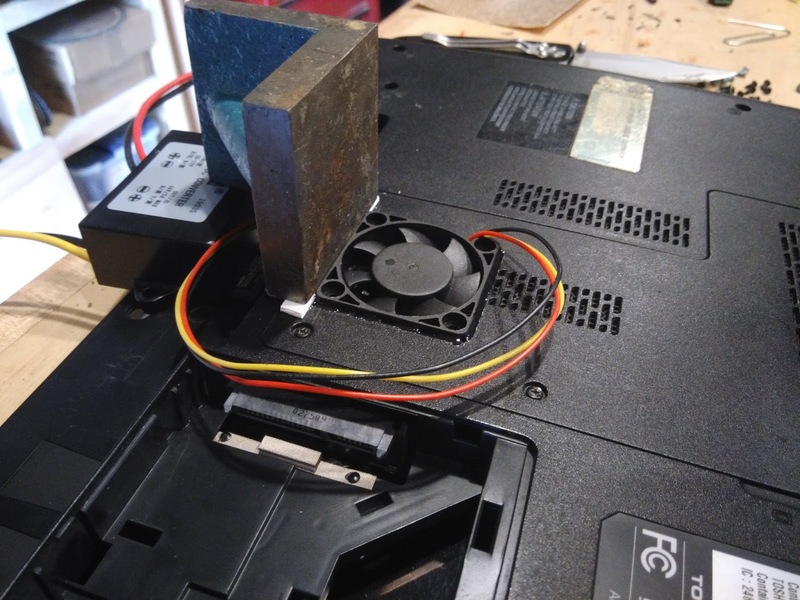 Because most laptops run off of dc power. The bus stores dc power. Why invert that power, at a loss, to ac, only to convert through the power cord, at a loss, back to dc? 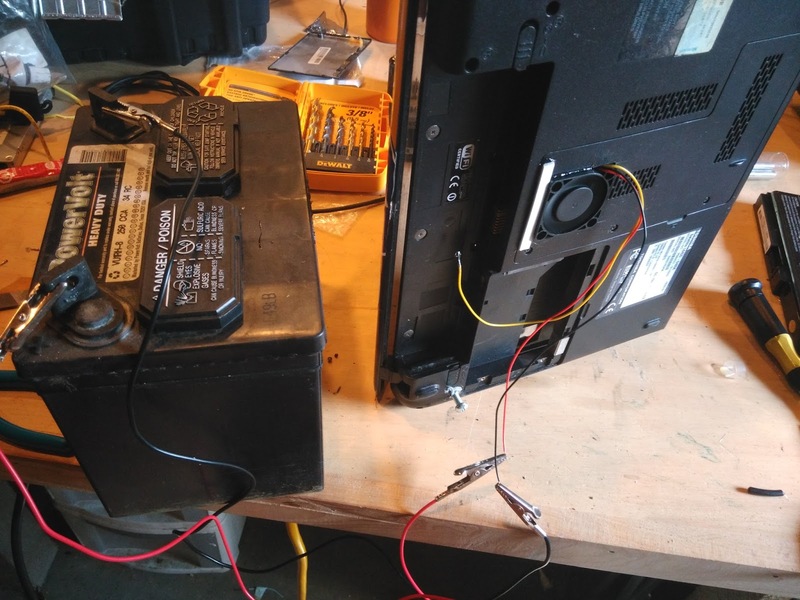 I cut out the middleman (alternating current) and found a 10-17v to 19v converter online. The large range on the input will allow for variations while the bus is running without worrying about frying the computer. 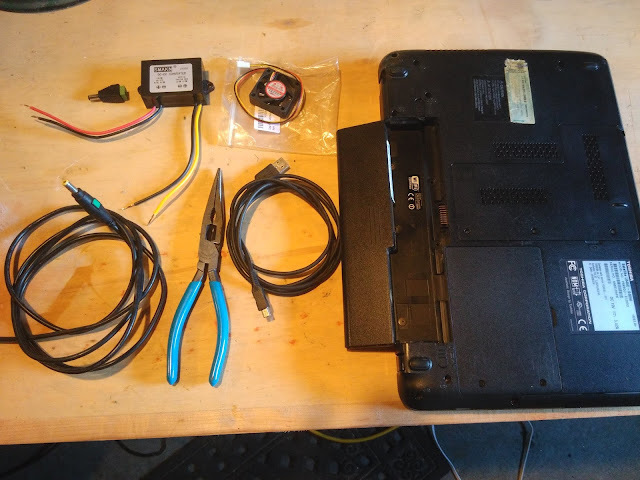 I gathered the old laptop, an old spare charger with evidence of a cat having chewed on it, the converter, and a 12vdc fan. I hacked out a hole in one of the panels, and glued the fan in. This machine gets hot. 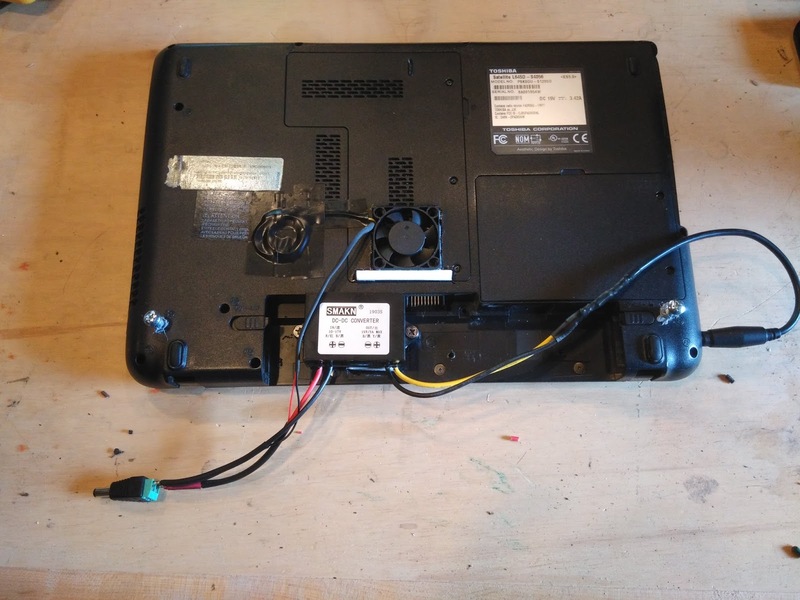 Afghan dust and Guatemalan volcanic ash have contributed to the laptop's fan working intermittently. Hang testing everything. 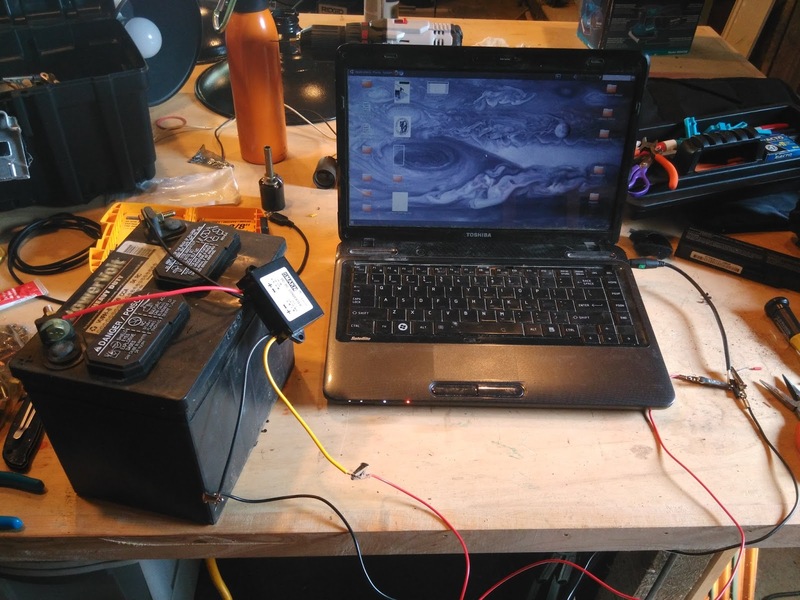 The laptop us running off of the lawn tractor battery. Everything soldered together, with a jack to plug into the bus's dc system. I added two screws as extended landing gear to keep the rear end elevated and exposed to cooling airflow. I'll bring this machine up to the bus to be the music player & weather station. 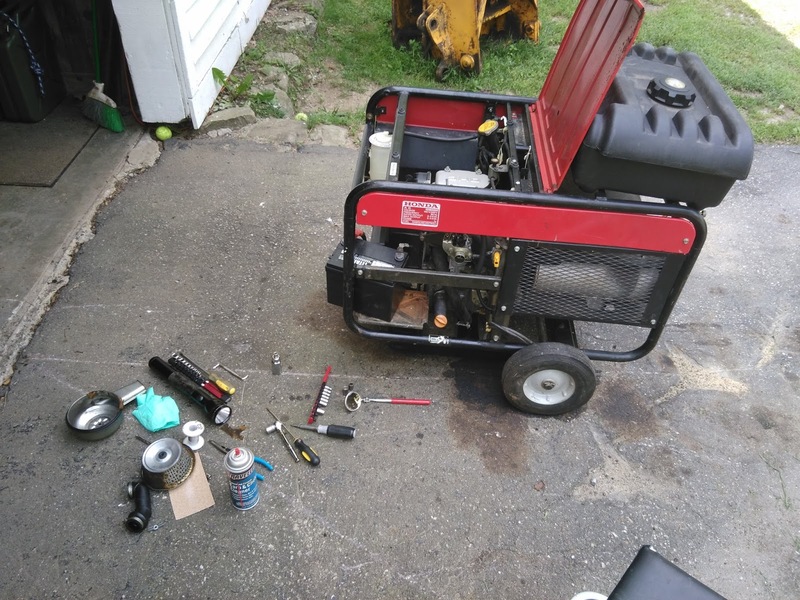 I also picked up a Honda generator which had refused to start. 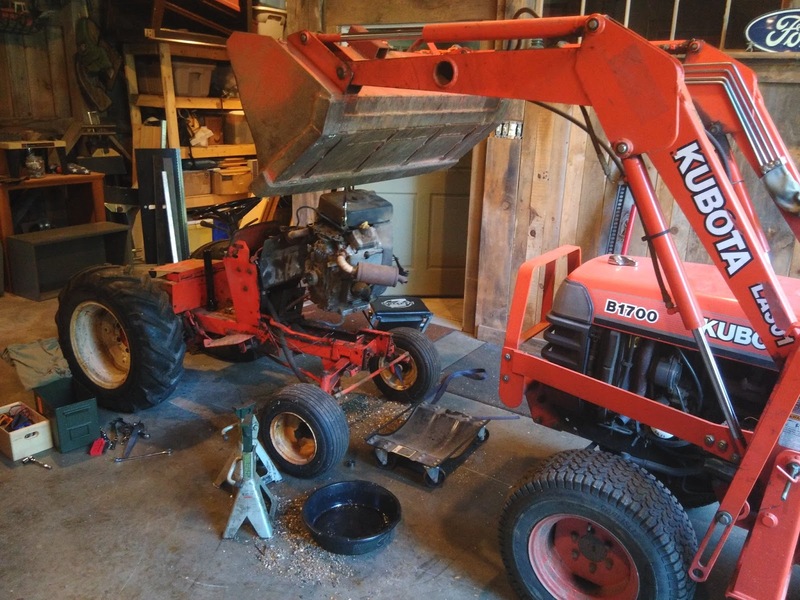 I sanded the spark plugs, cleaned out the carburetor of sandy, crystallized gasoline gunk, and it fired right up! I feel like I haven't accomplished anything until I put a blog post together. Apparently I've been busy.